Adds fun decorations to your college dorm room decor! Part of planning your dorm room decorating for the college year is planning your holiday dorm room decorations. You don't want to avoid dorm room decorating for the holidays. After all, if your parents decorate for the holidays you will want to do the same so you can make your college dorm room feel more like home. If there is a time you can get really homesick during the college year, it is during the holiday season, especially Christmas. So where should you start your Christmas dorm room decorations? With a dorm Christmas tree like our Champagne Fir Tree with Mini Lights! 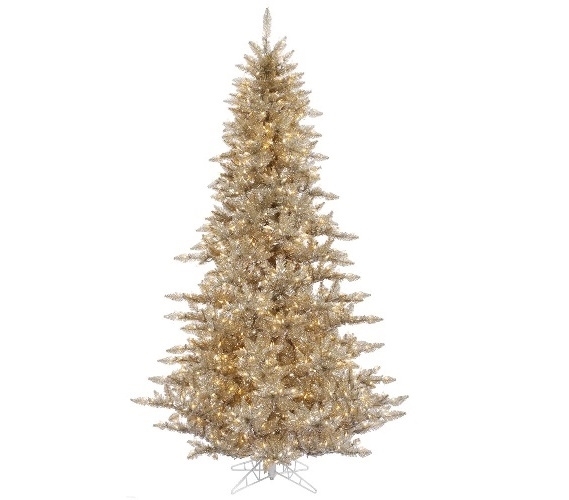 Our Champagne Fir Tree is a beautiful, compact dorm Christmas tree to add to your dorm room decorations for the holidays. The branches are a neutral Champagne color and even have clear mini dorm lights on gray wire wrapped around the branches. Your holiday dorm room decorations will pop and look amazing against the neutral colors of the branches. This dorm item is even perfectly sized for your college dorm room. Place this dorm necessities item in a corner of your college dorm room, add some garland and dorm ornaments to the branches, and your college dorm room will feel even more like home!